The tea ceremony is the most significant event in a modern chinese wedding as the traditional three prayers ceremony is usually not practiced. 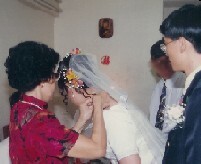 The bride is formally introduced to the groom's family through the chinese wedding tea ceremony. It will usually take place on the wedding day when most of the family members are present. If some members are not available, supplementary sessions can be conducted at the wedding dinner or at other convenient times and locations. When will you serve tea? The tea ceremony for the groom's side is usually in the morning once the couple has settled down a bit in the bridal home. Traditionally teochew bride is fetched to the groom's home before daylight. If it is really too early and the groom's relatives have not arrived for the tea ceremony, the couple can have a short rest or an outdoor photo-session while waiting. Tea ceremony for the relatives on the bride's side is usually held in the afternoon when the couple complete the "bride's home visit". In some family, the bride (and some will choose to do so together with the groom) may serve her parents tea in the morning before she is married. When she returns for the bride's home visit, she is already a married woman. Order of service, grandparents or parents first? However, there are also families that prefer to serve the grandparents tea before the parents. Within each generation, dad's relatives are served before mum's relatives. Well, you are introducing each other to your extended family, so it would be embarrassing if you have to be corrected for using the wrong title for your grand-auntie on your maternal grandma side at the chinese tea ceremony. Find out how to address three generations of relatives for the tea ceremony. Refer to the Three Generation Relationship Chart- Grandparents, Parents and Siblings. Which tea set to use? The tea set in the bride's dowry is used for the ceremony. The groom's sister or a relative will assist in pouring the tea and washing the cups. 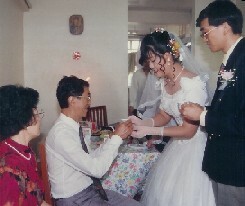 In very traditional family, the young couple is required to serve tea whilst kneeling down. Most modern family only requires them to bow while serving tea. Man on the left and Woman on the right, RIGHT? The bride will stand to the right of the groom. The male elder being served will sit facing the bride. The female elder will sit facing the groom. The bride and groom will bow to the elders and greet them by their formal title in the family while serving them tea. When do you serve an extra cup of tea? If a living member of the elder couple is absent, the other will drink on behalf of the absent spouse. However, tea is not poured out for a deceased spouse. After drinking the tea, the tea ceremony gifts for the bride and groom will be presented on the serving plate. The gifts are usually in the form of red packets or jewellery. Some relatives prefer the bride and groom to wear the jewellery gifts immediately and will even put it on for them. With generous relatives, you may look like a Christmas tree after the tea ceremony! Unmarried elder siblings will not present the couple with gifts after drinking the tea. The bride and groom will present gifts to the younger siblings and cousins who serve them tea. Remember to thank your helper! At the end of the ceremony, the groom will give the assistant a red packet for her help. Remember to prepare hot water for rinsing the tea cups if the sink is not readily available at the tea ceremony. The bride's parents will pay for the tea set which is part of the dowry. The chinese wedding tea set is a meaningful keepsake of the wedding. The bride will use it again when her own daughter gets married in the future. 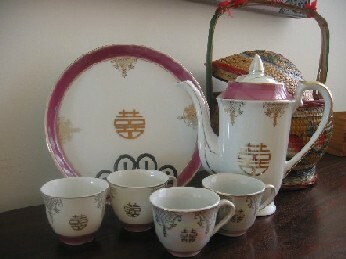 There are both western and chinese style tea sets. Tea sets with western style cups seemed to be the popular choice now. Popular designs include double joy, dragon and phoenix, peony or other flower motifs and gold trimmings. Tea sets designed specifically for chinese wedding tea ceremony will not have containers for creamer or sugar. The tea pot come in various sizes and are either round or oval. Usually four tea cups and a serving tray complete the set. The bride is sweet and so is her tea! Any sweet tea, symbolizing sweetness in the new union, is good for the chinese wedding tea ceremony. You can use sweetened red tea for simplicity sake, but some traditional chinese sweet teas are preferred for the good connotations in their names. Symbolizing that the couple will bear children quickly and continuously. The longan represents a "dragon" and the wish for having male children. 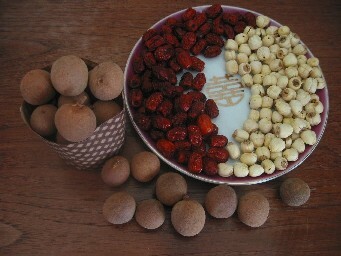 From left to right, dried longans in shell, red dates and lotus seeds.